Background: To investigate the association between body mass index (BMI) with serum iron and phosphate levels. Materials and Methods: Five hundred adults aged 18–65 years in Orlu, Imo State, participated in the study. BMI was determined from the participants' height and body weight. Serum iron and phosphorus levels were measured after 8–12 h fast. Results: The mean serum iron level for individuals with overweight, moderate obesity, and severe obesity was 64.21 ± 4.81, 59.11 ± 3.17, and 54.73 ± 3.44, respectively, for males and 52.86 ± 4.16, 44.77 ± 4.87, and 39.62 ± 5.11, respectively, for females as compared to 72.58 ± 5.43 and 61.19 ± 3.48 for males and females with normal BMI, respectively. Further, the mean serum phosphate level for individuals with overweight, moderate obesity, and severe obesity was 2.71 ± 1.82, 2.55 ± 1.17, and 2.51 ± 1.46, respectively, for males and 2.52 ± 1.87, 2.51 ± 1.67, and 2.48 ± 2.16, respectively, for females as compared to 3.72 ± 2.41 and 3.28 ± 2.11 for males and females with normal BMI, respectively. The serum iron and phosphate levels of obese individuals were significantly lower than in their counterparts with normal BMI (P < 0.05). 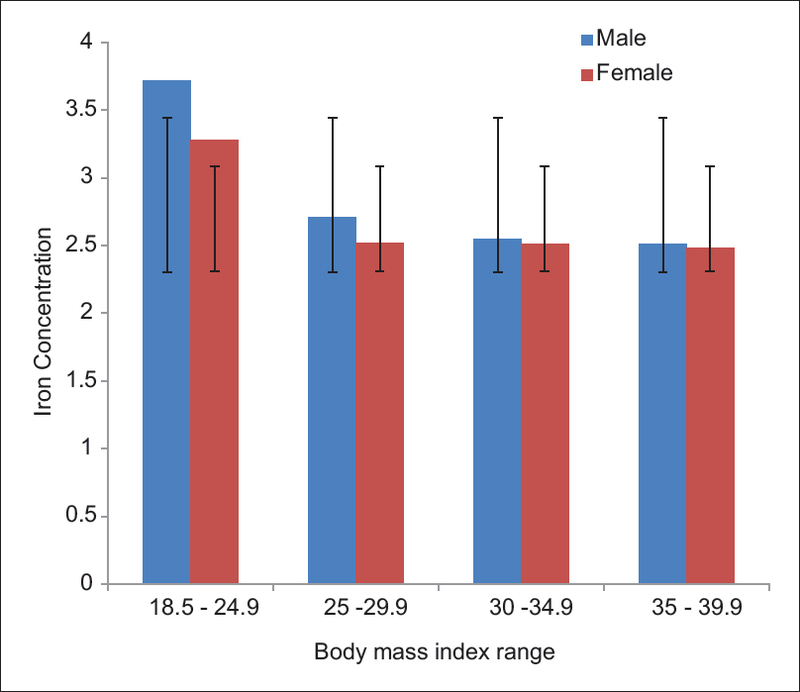 The prevalence of overweight and obesity for males and females was 36.33%, 35.97% and 36.93%, 33.78%, respectively. Conclusion: BMI inversely correlated with serum iron and phosphate levels. Regular assessment of nutritional status of the obese and intake of high iron and phosphate foods should be encouraged with a view to preventing iron and phosphate deficiency diseases. Background: Breast cancer is the most common type of cancer and the second leading cause of death in women. 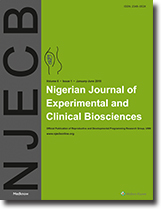 This research was conducted to obtain the information related to knowledge, attitude, and practice of breast self-examination (BSE) among female teachers in some selected secondary schools in Ogbomosho. Materials and Methods: Questionnaires were administered to 173 female teachers in some selected secondary schools in Ogbomosho to obtain information on their demographic data, knowledge of BSE, attitude to BSE, and practice of BSE. The teachers were selected randomly in ten public secondary schools in Ogbomosho. Results: Knowledge of BSE among female secondary school teachers studied in this survey revealed that of 173 respondents, 124 (71.7%) have heard of BSE before. While 103 (59.5%) of the respondents perceive to know how to perform BSE, 73 (42.2%) actually perform it. However, only 11 (15.1%) of those who perform BSE have ever felt lump in their breast. After which, they visit hospital for the diagnosis. Conclusion: This study revealed good knowledge (set of experiences, skills, or insight) and awareness (perception of knowledge using of that knowledge) of breast cancer BSE among the respondents. It is, however, necessary to educate female teachers on proper BSE examination and how to effectively educate and inform their female students. If teachers are adequately educated on breast cancer and BSE, they can transfer the knowledge to their female students. Background: Micronutrients are important risk factors in the assessment of the nutritional status of the obese. Aim: This study aims to investigate the association between body mass index (BMI) with serum calcium and magnesium levels. Materials and Methods: Five hundred adults, aged between 18 and 68 years, resident in Owerri Municipal, Imo State, Nigeria, participated in this study. Serum calcium and magnesium levels were measured after 8–12 h fast. BMI was calculated using the participant's height and body weight. The participants were further grouped into four based on BMI as follows: normal, overweight, moderate, and severe obesity. Results: The mean serum calcium levels of participants with overweight, moderate, and severe obesity were 2.62 ± 0.32, 2.76 ± 0.18, and 2.80 ± 0.26, respectively, for males and 2.34 ± 0.13, 2.46 ± 0.12, and 2.50 ± 0.18, respectively, for females as compared to 2.32 ± 0.41 and 2.02 ± 0.11 for males and females with normal BMI, respectively. Furthermore, the mean serum magnesium levels for individuals with overweight, moderate, and severe obesity were 0.95 ± 0.03, 0.90 ± 0.05 and 0.84 ± 0.03, respectively, for males and 0.91 ± 0.01, 0.88 ± 0.01, 0.81 ± 0.02, respectively, for females as compared to 0.98 ± 0.05 and 0.94 ± 0.02 for males and females with normal BMI, respectively. The serum calcium levels of moderately and severely obese individuals were significantly higher than their counterparts with normal BMI (P < 0.05). Conversely, the serum magnesium levels of moderately and severely obese patients were significantly lower than their counterparts with normal BMI (P < 0.05). Conclusion: BMI correlated directly with serum calcium and inversely with serum magnesium levels in obese patients. Micronutrients such as calcium and magnesium should be considered in the management of obesity/overweight. Background: Oral squamous cell carcinoma (OSCC) develops from potentially malignant lesions. Cells of the immune system are comprised of lymphoid series and myeloid progenitor series cells. Mast cells (MCs) and tissue eosinophils are both granulocytes which come under the myeloid progenitor series of the immune cells system. Inflammatory cells are found to play a crucial role and therefore should be studied in detail using various simple histochemical stains. Aims and Objectives: To evaluate the presence and compare infiltration of MCs and eosinophils in potentially malignant disorders and OSCC using special stains. Materials and Methods: Twenty-five cases of previously diagnosed cases of OSCC, 13 cases of oral submucous fibrosis, and 12 cases of oral leukoplakia (50 cases) were retrieved from the archives. Congo red and toluidine blue staining were performed for eosinophils and MCs, respectively. Analysis was done using analysis of variance and independent t-test, and P ≤ 0.05 was considered for statistical significance. Results: The mean number of MC and eosinophils was more in OSCC when compared to potentially malignant disorders. There was a significant correlation between eosinophils and MCs in potentially malignant disorder and OSCC. Intact MCs were more in number in potentially malignant disorder than in OSCC, and the mean number of degranulated MC was more in OSCC than in potentially malignant disorder. Conclusion: Eosinophil chemo-attractant factor released by MC invites more number of eosinophils during tumor progression. MCs and eosinophils may serve as a novel therapeutic target for cancer treatment, and inhibiting their function may inhibit tumor progression. Eosinophils and MCs can be visualized using Congo red and toluidine blue stain, respectively, which is accurate and easy to perform. Background: The current global economic recession has made modern drugs expensive, not easily accessible and affordable, thereby making alternatives such as medicinal plants including Moringa oleifera imperative. Aim: This study assessed the immunomodulatory effects of the leaf extracts of M. oleifera on male Wistar rats. Materials and Methods: Forty-eight male Wistar rats weighing between 180 and 250 g were randomly divided into eight groups of six rats each. Group I served as the positive control. Groups II, III, and IV were administered oral doses of 125, 250, and 500 mg/kg of M. oleifera leaf extracts, respectively, for 15 days. Cyclophosphamide (CTX) at a dose of 30 mg/kg body weight was administered orally to Groups V (negative control), VI, VII, and VIII for the first 3 days. Thereafter, 125, 250, and 500 mg/kg doses of the extract were administered, respectively, for another 15 days. On days 16 and 19, blood samples were collected through cardiac puncture and analyzed for red blood cell count, hemoglobin concentration, total white blood cell (WBC) count, percentage differentials of WBCs, and liver enzymes (alanine transaminase [ALT], aspartate transaminase [AST], and alkaline phosphatase [ALP]). Results: Results showed statistically significant dose-dependent increase in total WBC (TWBC) count and percentages of neutrophil, eosinophil, monocytes, and lymphocytes in Groups II, III, and IV compared to Group I. It also showed that the extract statistically reduced serum hepatic enzymes (ALT, AST, and ALP) in Groups II, III, and IV compared to Group 1 (P < 0.05). Administration of CTX significantly reduced TWBC count and percentages of neutrophil, eosinophil, monocytes, lymphocytes, and increased serum hepatic enzymes (ALT, AST, ALP) in Groups VI, VII, and VIII when compared to Group V (P < 0.05). The effects of CTX on blood and hepatic enzymes were reversed with administration of the extracts in a dose-dependent manner (P < 0.05). Conclusion: Our findings showed that M. oleifera leaf extracts have stimulatory effects on the production of WBCs and also have hepatoprotective potentials. Thus, it may have immune-modulatory properties.